The first of four Warwick Brexit Briefings on Employment is released today by the University of Warwick and its Connecting Research on Employment and Work (CREW) network. Each Brexit Briefing draws on the latest University of Warwick research to highlight key issues facing UK policymakers and other stakeholders as they design a post-Brexit employment policy. Regulating EU migrant labour - lessons from the construction industry looks at different models for managing migrant workers after March 2019. With less than 18 months to go until the UK leaves the EU, the University of Warwick is launching a series of briefings exploring the implications of Brexit for the job market, workers’ rights, and employment policy. Each of the Warwick Brexit Briefings on Employment has been written by experts from the University’s Connecting Research on Work and Employment (CREW) network and reflects current Warwick research. The briefings will cover migration and skills, unemployment and training, job creation and loss, and employment rights. 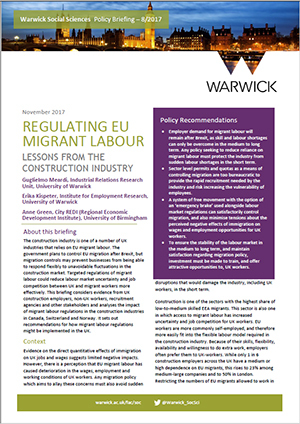 The first paper, launched today at a lunchtime briefing session in Westminster, sets out recommendations for how migrant labour regulations might be implemented in the UK after Brexit, with the construction industry as its case study. Regulating EU migrant labour - lessons from the construction industry has been written by Professor Guglielmo Meardi and Dr Erika Kispeter from the University of Warwick and Anne Green from City REDI (Regional Economic Development Institute), University of Birmingham. 1 in 6 construction employers across the UK have a medium or high dependence on EU migrants. This rises to 23% among medium-large companies and to 50% in London. Norway, Switzerland and Canada offer possible models for UK immigration policy. Warwick researchers have analysed the effect of these models on the construction industry and summarise their findings in the briefing paper. The paper sets out a series of measures which could provide the effective control of migration that people demand without damaging the construction industry or increasing exploitation of its workers. "We're launching the Warwick Brexit Briefings on Employment to help policymakers and employers navigate the monumental task of disentangling UK and EU employment regulation, and designing a wholly new UK system. "Each briefing is based on expert research and highlights the key issues that the UK needs to tackle in its preparations for life outside the EU. "We hope these briefings will be a valuable, reliable contribution to the policy debate and will also help employers and industry bodies make well-informed decisions about the future." The briefing papers will be presented to an invited audience of parliamentarians, employment organisations and other stakeholders in Westminster each week between now and 7 December, and will be free to download. Click here to download a copy of Regulating EU migrant labour - lessons from the construction industry.